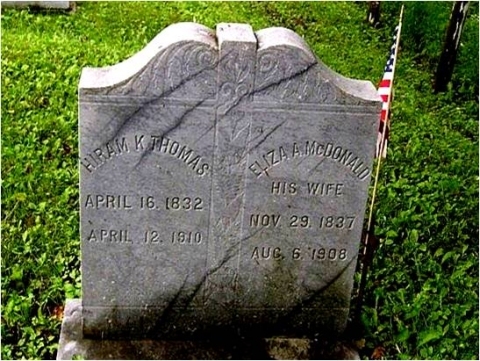 Hiram K. Thomas after a short sickness of a few weeks died at his home here Tuesday, April 12, and was buried beside his late wife, Eliza A. McDonald, in the village cemetery. Mr. Thomas was born in Wheelock April 6, 1832, and the most part of his life have been spent in Wheelock or Sheffield, with the exception of 10 years in Manchester, N. H., when he worked in the cotton mills. Mr. Thomas was a man well known and honest. He was a member of the Methodist Church, and until lately when his health began to fail, he had been a constant attendant, always ready to help by his presence or his money as far as was able. He enlisted in the Civil War in 1863. He was a member of the G.A.R. in Wheelock. The funeral was largely attended. He was one of a family of 11 children, only three are left, a brother and two sisters. He leaves two children and one grandchild, L. J. Thomas, of this place, and Mrs. Jennie Richards, wife of Charles Richards, and Mark Richards, and Mabel Richards, his grand daughter.